The fleet (pack? herd?) is growing. And a CB550 update. I sold him the trike in the background! Small world. This will be 350X number four. It has issues. 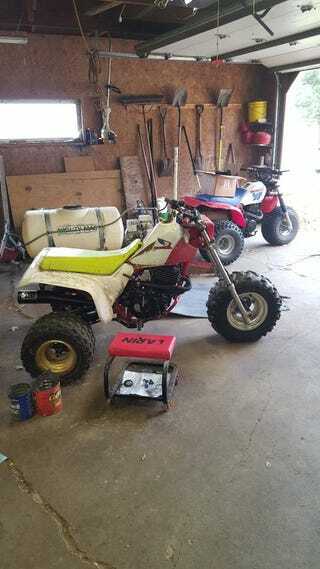 The top end was just rebuilt but the clutch is messed up and it needs a carb. Being on CL means there are probably more issues as well but it’s worth it. Why, yes. I did ArmorAll the tires! I’m trading even up for my 200X which makes me a bit sad. That 200 is a super reliable machine. Starts first kick every time in -15 temps or even after sitting for a month or so. As it should, really. I put a lot of time into it to make it that way. He’s just a tad too small for a person of my *ahem* stature. I think “Elephant riding a Mouse” was uttered at least once during an outing. The 350X makes the same power as a modern 400EX quad, has a better gearbox and weighs 150lbs less. These are good things. The only thing that bugs me is that I may be counting my Ducks before they hatch with this being a CL deal. Saturday is a way off yet. The CB550 is coming home the weekend of the 18th. They have so much stuff they want gone I need to make two trips. I’m considering renting a box truck at this point because it’s 7 hours round trip from Dubuque to Chicago but it’s going to be worth it.